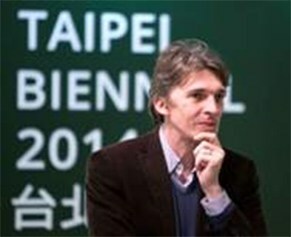 Taipei Fine Arts Museum announced Nicolas Bourriaud as the curator for Taipei Biennial 2014. The 9th Taipei Biennial will be taken place Sep 13, 2014 to Jan 4, 2015. The French art scholar, curator, Nicolas Bourriaud, born in 1965, is currently the director of Ecole des Beaux-Arts, Paris (ENSBA). His arts theory book, Relational Aesthetics, published in 1998 has been translated in twelve different languages around the world. He therefore becomes one of the most influential arts critics in the Western contemporary arts world. Bourriaud co-founded the Palais de Tokyo, the center of contemporary arts in Paris, with Jérôme Sans, and was co-director from 1999 to 2006. In 2007, He was invited to be the Gulbenkian Curator of Contemporary Art at Tate Britain and curator of “Altermodern” the fourth Tate Triennial (2009). He has been the director of ENSBA since 2012, and organized exhibitions for the Palais des Beaux-arts, which were “The Angel of History” and “CookBook”. He curated for the first and second edition of Moscow Biennale (co-curator in 2005, 2007), and the Lyon Biennale (co-curator, 2005) and the Athens Biennial (2011). To describe capitalism in the 19th century, Karl Marx talked about a “ghost dance” pulling along the humans, their products and their environment. Reification on one side (the transformation of the living into an object) and prosopopeia on the other (a figure of speech that represents an object or a dead person speaking) are the two major patterns of the new « ghost dance » of global economy. But in addition to these two figures, we could add montage, as a connection principle between heterogeneous realities. The sphere of inter-human relations cannot be conceived anymore without its environmental and technological sides. Since the beginning of the XXIst century, contemporary artists tend to renegotiate their relationships with both technosphere and biosphere, exploring the knots that link the living and the object, the machine and the body, the technological and the social – and experiencing their interdependence. The uprising of a new « global spirituality » in art appears in the focus made on outsiders and occult forms in the last Venice Biennial, or in the recent calls for an « animist » state of mind in the arts. In the theoretical field, Bruno Latour calls for a « parliament of things », while a recent philosophical movement, « Speculative realism », criticizes anthropocentrism and the notion of « human finitude » so present in western thought : for those philosophers, thinking and being are not correlated, and the human individual does not have any preeminent position in the access to being. Quentin Meillassoux even rejects the necessity of all physical laws of nature, and Graham Harman considers everything as an object, whether physical, fictional, living or inert. Others, like François Jullien, reexamines western philosophy in a critical way, by confronting its basic concepts to chinese thought, in which he identifies new potentialities. This movement of cross-pollenization, both cultural and techno-scientific, might lead us to a possible global refoundation of aesthetics, and it will be at the heart of Taipei Biennial 2014. The exhibition will adress the cross-overs appearing in the art of the anthropocene ; it will focus on artists for whom objects, products, computers, screens, chemistry, natural elements or living organisms are interconnected with humans, and can be used by them for a critical analysis of contemporary world.